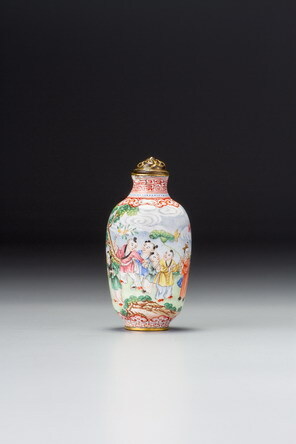 This is another of the masterpieces from the hands of the early-Qianlong palace enamellers. The impeccably painted subject is contained within elaborate, fanciful, and unique borders; rope borders are, unusually, plaited around the narrow-side panels. Rope borders were a standard palace workshop design element derived from the decoration on Warring States and Han dynasty bronze vessels in the vast Imperial collection of antiquities. They appear on a wide range of palace arts. One of the few extant enamelled metal bottles from the Yongzheng palace workshops has main panels framed in a rope border (Chang Lin-sheng 1991,no. 7), demonstrating its use prior to the Qianlong era, when it became standard. Many palace works in a variety of media from the Qianlong reign incorporate rope designs, either as the main decoration or as a frame or border design. The rare olive-green ground seen on the formalized floral surrounds of Sale 1, lot 129, is also found here as a small panel beneath the main-side designs and as one line of the neck band. The enamels have fired well, although the ever troublesome paler, yellowish green is revealed, under magnification, to have pitted in the usual manner. This is definitely an original stopper for an early-Qianlong, palace enamel bottle. It is of the same subject, style, and metalwork as those we can be certain are original. It also has the typical palace ivory spoon with its pear-shaped bowl and perfect length, but the fact that the stopper is a little oversized for the bottle may indicate that it has come off another bottle, as may the difference in wear between the stopper and the outer neck rim, which, unlike the stopper, is missing much of its original gold. For another example from the same period, with similar subject matter, also with a rope border around each panel, see Sotheby’s, Hong Kong, 28 April 1998, lot 1257.